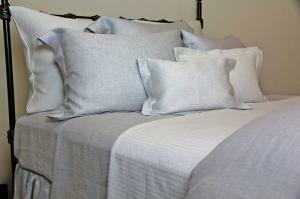 The SDH Canterbury Linen bedding collection from Earthsake - the finest finishing touch you’ll ever add. This update to the traditional linen sheet in our exquisite, all-natural SDH bedding line is brushed with color. This luxurious Italian woven linen sateen is lightweight and crisp. Available in Stucco, Dijon, Rye, and Dove. Shown on bed in Dove with Canterbury sheeting, Kent Duvet and shams, and Emma blanket. Fitted Sheets are sewn with a 13.5" height plus 3" tuck under & elastic all around. Supreme fitted sheets are sewn with a 17" height plus 3" tuck, please call for pricing. Duvet covers & pillow cases have buttoned closures. Bedskirts are paneled and adjustable up to a 19" drop. Canterbury is OekoTex Certified which means that the product is tested and guaranteed to be free of all harmful substances including toxins and irritants. Making sure that the products in your home are safe natural and healthy. Packaging: All of SDH packaging is recycled and recyclable. We stand behind their efforts to protect and preserve the environment and encourage our customers to join us. Certifications: Canterbury is OekoTex Certified which means that the product is tested and guaranteed to be free of all harmful substances including toxins and irritants. Making sure that the products in your home are safe natural and healthy.